Back to Business Week has culminated in Merimbula with an inspiring presentation from Canberra based business coach Natasha Vanzetti. 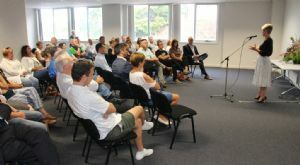 Around 50 business people from across the Shire gathered at the Bega Valley Regional Learning Centre to take part in a dynamic discussion aimed at building new and existing businesses in the region. “Natasha’s own story is one that all business people can relate to,” said Linda Mayo, Coordinator of the Bega Valley Regional Learning Centre. The event was a partnership between Bega Valley Shire Council, the NSW Department of Industry and the Merimbula Chamber of Commerce. Chamber president and local real estate agent, James Smith was wrapped to see the collective wisdom of the local business community turn out. “It’s hard to get business people to stop and check in with themselves because the demands of your own business can be overwhelming,” Mr Smith said. Back to Business Week events have been held around NSW, an initiative of the NSW Department of Industry that celebrates small to medium businesses and the role they play in local communities. “Council has a role to play in building a strong local economy and helping small business and the Regional Learning Centre is a great entry point to access that support,” Ms Mayo said. 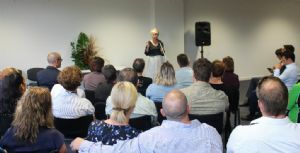 Photographs: Around 50 people from small businesses across the Bega Valley attended a dynamic “Back to Business’ week event in Merimbula with Canberra based business coach Natasha Vanzetti.